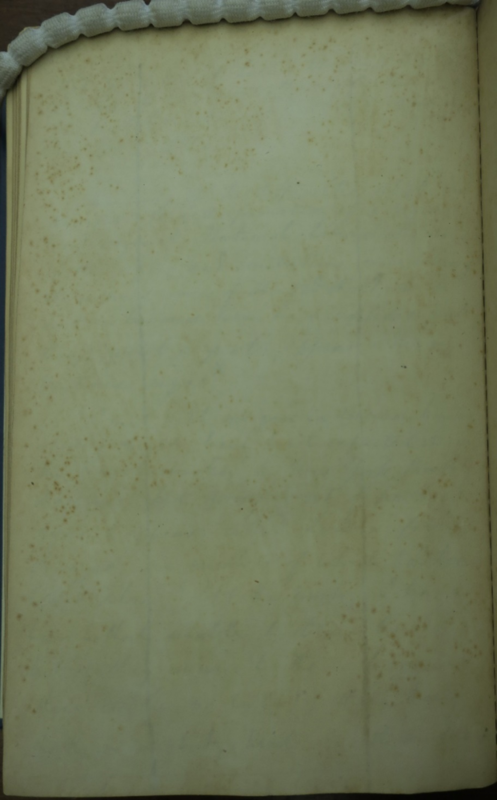 As mentioned in my previous posting (Evidence of Mill’s Reading and of Reading Mill), among the books held in section D of the Mill Library are four bound volumes of article offprints. 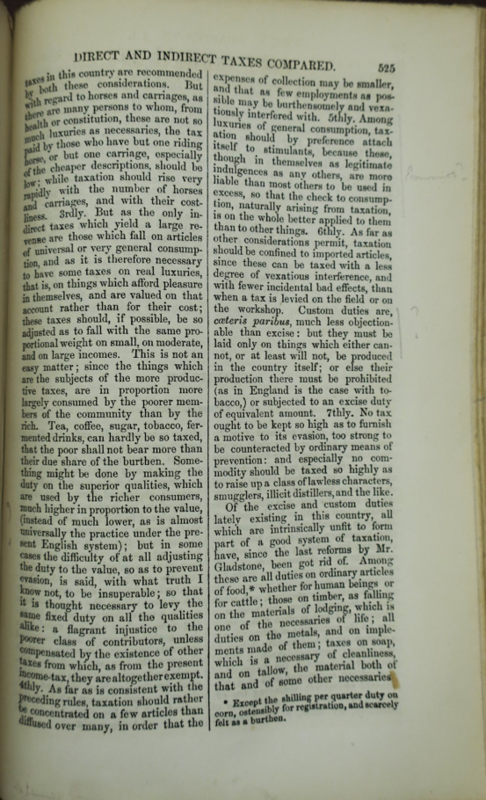 Nearly all operating at a loss, nineteenth-century periodicals tended to economize on paper by allowing no dead space between articles, which means that Mill’s offprints sometimes start in the middle of a page with the final paragraphs of the preceding article above, or end with enough room for the following article to commence at the bottom of the final page. If they begin on the even-numbered verso side of a given sheet, then the recto side of the first page of the offprint features the last full page of the earlier article; and, if they end on the odd-numbered recto side of a sheet, then the verso side of the last page of the offprint usually includes the first full page of the next article. All of which can add up to a substantial amount of other writers’ text attached to the beginning, ending, or both of a review essay written by Mill. At some point, much of this extraneous verbiage was struck through in heavy black ink and then papered over for good measure, leaving Mill’s printed words in sole possession of the field represented by the bound volumes in section D. The question of who did this and when remains open, and is sometimes complicated by what remains visible still underneath the pasted-in sheet. 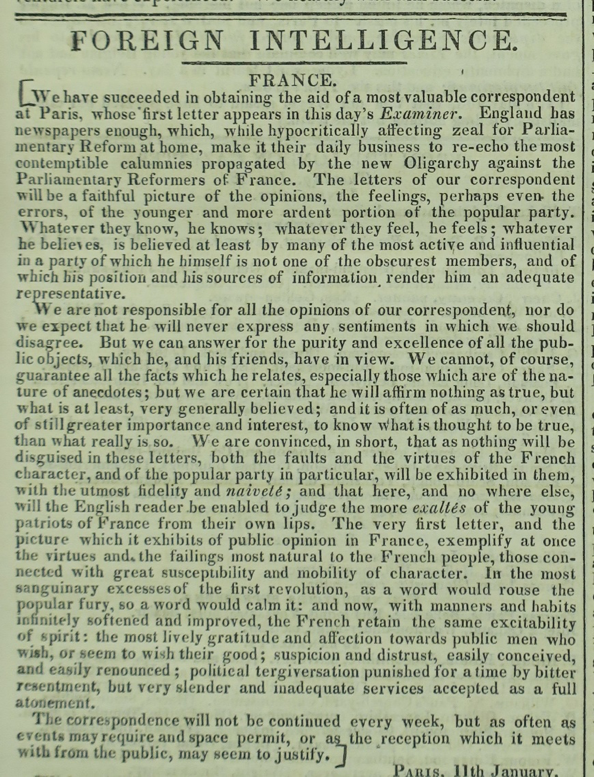 The presence of Mill’s hand at the top of the recto face of the first sheet of the article suggests that he was not particularly bothered by the layout consequences of early Victorian periodical publication. 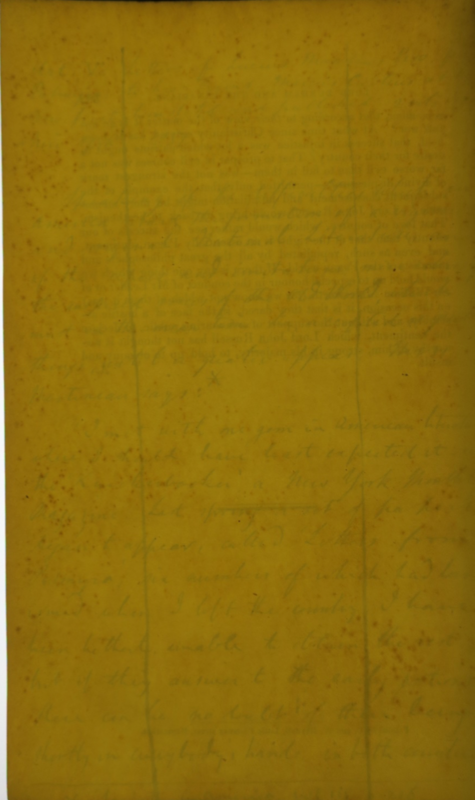 Unless he came to believe that having the page to himself was more important than accurately recollecting the original publication details, then, it seems unlikely that he papered over his own annotation. To most modern scholars, it will probably seem extraordinary, even outrageous, to privilege reusable and much reproduced type over unique and previously unknown script. 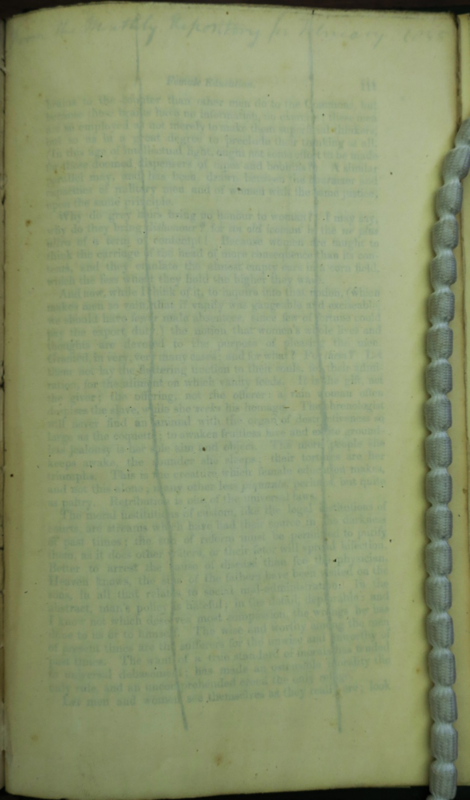 Less shocking, but perhaps equally interesting, is what the presence of Mill’s fair copy for one article on the verso side of the final page of another article suggests about his valuation of his own offprints. Far from the sacred record of previous publication (how many of us have a shelf/box/drawer devoted to our own in-print acceptances), at least the back side of Mill’s LWR piece on the complex social and political circumstances of British Canada was valuable only as scratch paper, as a surface on which to work out what was not even an original system of logic or updated theory of political economy or impassioned apology for individual liberty, but instead a laudatory review of an American writer’s imitation of epistolary correspondence in Antiquity. 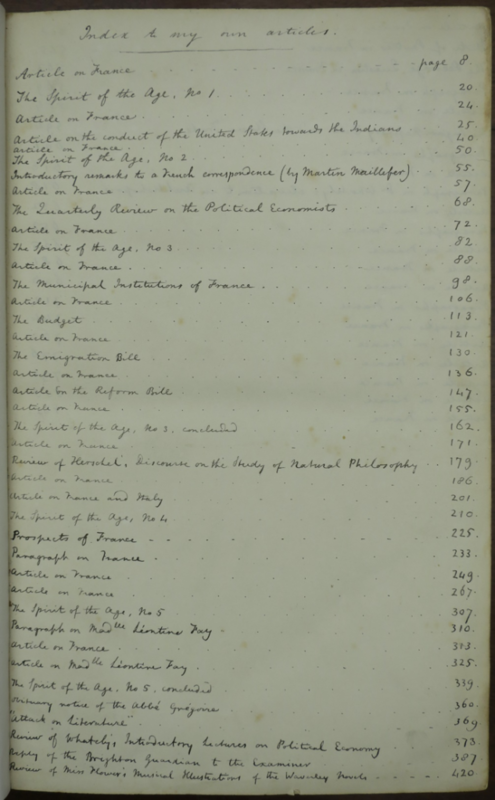 One might well wonder what Mill would have thought of the decision to bind his assorted offprints into book form in the first place, much less to attempt – happily unsuccessfully – to excise all signs of their original periodical context and attendant hand-written text.